A new safari lodge in Kenya was built where the sweeping Meryl Streep and Robert Redford epic Out of Africa was filmed 30 years ago. Overlooking the Maasai Mara National Reserve, Angama Mara comprises two tented camps and a floating guest area constructed in part using a brick technique popular with Maasai builders. Designed by South Africa's Silvio Rech and Leslie Carstens, the safari destination fuses contemporary vernacular and colonial design for a sublime vacation experience. Albeit a luxury destination reserved for the elite few who can afford to shell out over $800 a night, Angama showcases the finest hospitality and interior design the African continent has to offer. Deliberately cinematic to match the natural drama unfolding below in the wildlife refuge, the lodge features two sets of elevated tented suites with canvas on the roof and three sides and a floor-to-ceiling glass face that integrates guests with the wilderness while simultaneously providing safe distance. Inspired by Nairobi’s Muthaiga Club, which was built in 1917 and featured in Out of Africa, the conical brick guest areas comprise a large open-plan room wrapped in stacking glass doors and divided by internal columns and shifts in floor level changes. A massive deck hovers over the edge of the Great Rift Valley, and if it storms, guests have ample room to huddle inside behind large glass walls. The oval library provides something of a cocoon-like retreat. A departure from the stereotypically idyllic, off-grid African safari experience, Angama offers a fitness room, WiFi, and a swimming pool – though there are opportunities to interact with the Maasai and go on landrover adventures. 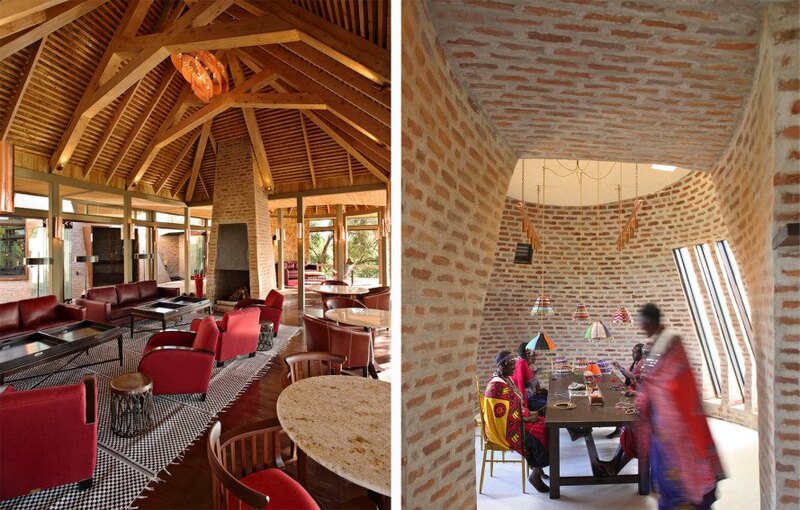 Check out the Ngongoro lodge perched inside a volcano in Tanzania, which was built several years ago by the same team of people. Angama Mara is a new safari lodge overlooking the Maasai Mara in Kenya. The designers took inspiration from colonial architecture and Maasai vernacular. Two groups of tented suites hover over the edge of the Great Rift Valley. The suites each have a glass face and massive deck. In poor weather, guests can huddle in a large open plan room. Guests have access to a swimming pool and other luxury amenities. The brick work featured in the guest areas mimics Maasai vernacular.